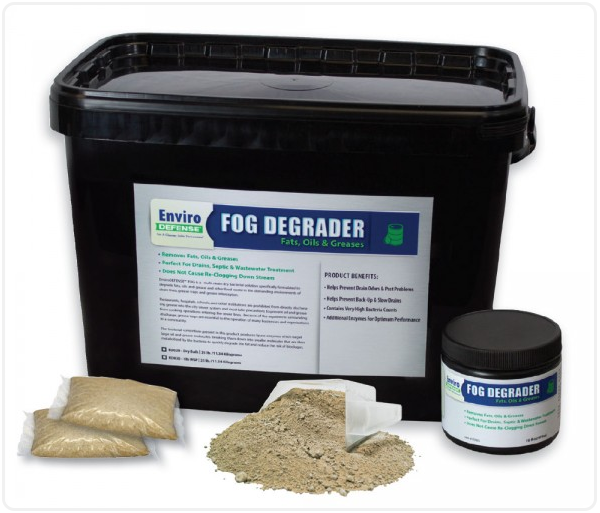 EnviroDEFENSE® FOG Degrader is a powdered product for use in wastewater systems and grease traps. Grease build ups are often the cause of slow drain and sewage back-ups as well as creating drain odors and even pest problems. EnviroDEFENSE® FOG Degrader is developed for grease traps, associated drain lines and fat problems in water treatment plants. The images below show the degradation of fats, oils and greases by EnviroDEFENSE® FOG Degrader in a wet well from a packing house. In one month, EnviroDEFENSE® FOG Degrader removed more than 75% f the fats, oils and greases clogging the well and lines. Photo on the left shows the well before using Fog Degrader. The photo on the right shows the well one month after treatment.